For copies of the book purchased between September 2011 and August 2012. For Flyleaf patterns that show “2010” in the top right hand corner. I am knitting the Dana one skein shawl and am at the point to start the knit in edging. My question is, does it go all around, do I just do it along the final edge of 205 stitches? Or do I do it along the finished edges and bind off the 205 stitches? You’ll knit the knit on edging using the live stitches. Binding them off and then picking up around the finished edges would be a lot of work! In the Fleurdelise shawl, I think the ssk explanation is wrong. Are you sure ssk is “slip, slip, knit”? BTW: do I havbe to knit the first stitch? Slip, slip knit is the correct definition for SSK. I’ve found knittinghelp.com to be a wonderful resource when you’re not sure about a knitting term. There are free videos that will show you ssk and many other definitions. directions state “On Row 7 and 15 knit as written untill the last 6 sts, then work k2tog, double yo, k2tog, k1, k2tog instead of k5, k2tog….. I very confused as the k5, k2tog is not in the directions as the last sts of row 7 but at the beginning. —I knit row 7 from chart C until the last 6 sts and then knit k2tog, double yo, k2tog, k1, k2tog – I then worked row 8 – when I knit row 9 there are supposed to be 10 stitches left before the edge – but now there are 12 stitches??? The last 6 stitches of Row 7 are k5, k2tog as the pattern states. 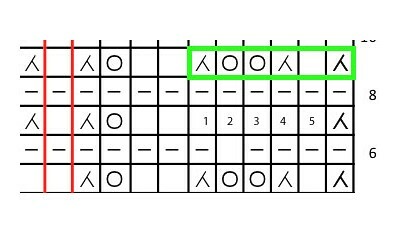 What you are doing is replacing the “k5, k2tog” shown in the image as knit stitches (1, 2, 3, 4, 5) with the “k2tog, double yo, k2tog, k1, k2tog” that is outlined in the green. You are doing this to ensure that the double yarn overs line up when you complete the short rows to turn around the center point of the shawl. There won’t be any extra stitches after you work one regular row (in this case Row 9) after you work a short row to finish off the short row. Please follow Row 9 as indicated in the pattern and your stitch counts will be fine. Have you worked a pattern with a short row center before? If not, I’ve written a post that should help clear up things. You may read it here. Also please direct any further questions to the Fickle Knitter Design group on Ravelry! We have lots of amazing knitters there who can offer advice from when they knit Flyleaf. Thanks Barbara for taking the time to comment!